I have arrived in Canada for a couple of days. Last night, I took place in a hockey pool. 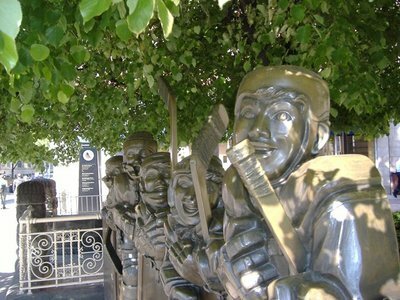 In a hockey pool, a bunch of guys get together and drink at a bar. Oh, and we also pick hockey teams. Each guy picks a team of 18 players, and throughout the hockey season we keep track of the goals and assists the players get, and then at the end of the hockey season (sometime next summer - it's a long season), the guys with the three best team win some money. The guy in first, in addition to winning money, wins this trophy as well. 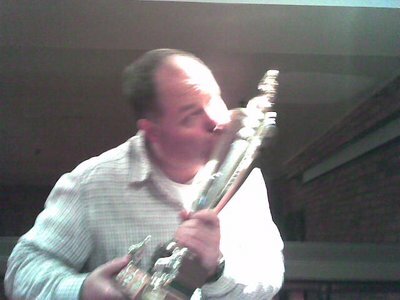 Last year, I won the pool, and thus was able to celebrate my win by kissing the trophy. Sorry about the quality of the pictures. It was using my mobile phone's camera, which isn't fantastic, the bar was dark which made it hard to the camera to find focus, and it was also quite late in the evening, after a few pitchers had been consumed, so I think the photographer's hand might have been a little less than steady. I am now debating what to do with the trophy. I could take it back with me to London, but I am afraid there really isn't enough room in my bag. Perhaps I'll just donate it to the Hockey Hall of Fame here in Toronto. thats wicked!! 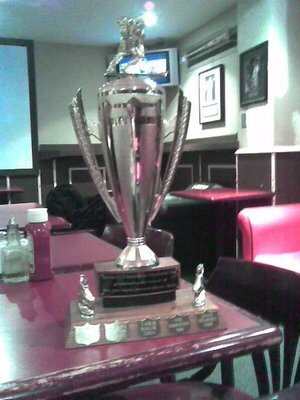 ive been running a basketball fantasy league for 9 yrs now and this is the first year we're getting a 'keeper' trophy..so ya the next 5-6 months are going to be glued to box scores. Hah, I play in one of these online football fantasy leagues. Luckily, you get to change a couple players every week though, so there's a bit of room to move. Good fun though!